Philadelphia is the fifth most populous city in the United States and the most populous city in the state of Pennsylvania, occupying all of Philadelphia County.6 As of the 2000 census, the population was 1,517,550. A July 1, 2002 census estimate showed the population dropping modestly to 1,492,231. The Philadelphia metropolitan area is the sixth largest nationally, with some 6.2 million people. Philadelphia is the central city for the Delaware Valley metropolitan area. 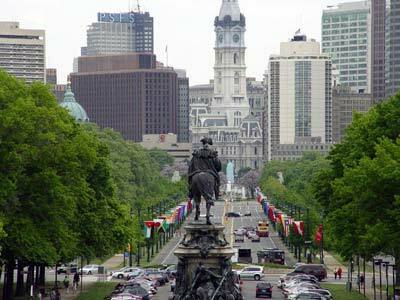 Philadelphia is one of the oldest cities in the United States. It has played a critical role in American history and the birth of American independence, democracy, and freedom. During part of the 18th century, the city was the second capital and then-most populous city of the United States. At that time, it eclipsed Boston and New York City in political and social importance, with Benjamin Franklin playing an extraordinary role in Philadelphia's rise. Two airports, Philadelphia International Airport and Northeast Philadelphia Airport, reside within the city limits. Its cultural diversity is reflected in the music and musicians that have come from or through Philadelphia: the R&B styles of Jill Scott and Patti LaBelle, the jazz of Grover Washington Jr., Stan Getz, and Sun Ra, the rock of Pink, the rap of Will Smith, and the opera of Marian Anderson. Famed comedian Bill Cosby was born and raised in Philadelphia.